A disclaimer: I am not a vegetarian, and hence I won’t presume to judge how pure the vegetarian meals are in Simple Life. I’m taking their word for it: The food at Simple Life does not contain MSG, trans fats, colouring or preservatives; they use natural and organic ingredients. They also claim to use extra virgin coconut oil and brown instead of white sugar in their cooking. However, they do feature eggs in some of their dishes, but you can always tell them to omit that if you’re strict with your diet. 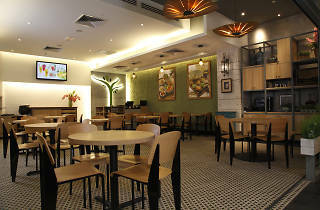 I’ve visited Simple Life several times, and mostly their outlet in The Gardens Mall (they have a total of ten outlets). 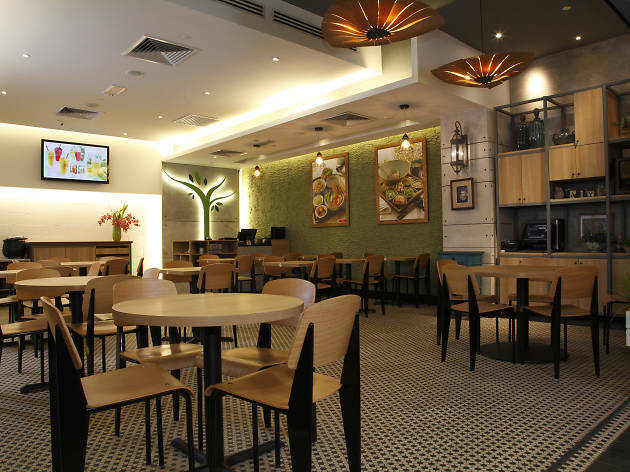 The menu is very well presented and there are lots of interesting choices, from rice dishes and noodles to steamboat, multi-grain porridge, lei cha, charcoal sandwiches and yes, even pizza. I ordered the vegetarian assam fish set meal, and it came in a beautifully laid out tray filled with a bowl of clear corn soup, a bowl of multi-grain rice and several small side dishes. The food looked appetising and tasted surprisingly good. The assam fish (which is seaweed wrapped bean curd, really) tasted just like the usual assam gravy with all its spiciness and piquancy, complete with long beans, brinjal, lady’s fingers and tomatoes. The side salads were particularly memorable, thanks to the nutmeg dressing that added a sharp tanginess to the palate. I went to its Suria KLCC outlet for my second visit, which is more of a stall in the Signature food court. The menu here is limited, featuring mostly single-dish meals. My spicy fried soy noodles came looking like a colourful heap of salad, with taupok, baby corn, choi sam, various mushrooms, shredded beetroot and lots of cili padi. The noodles, which looked like kuey teow, were just a tad wet to hold all the flavours together, and it was really tasty. On another visit, I decided to try their brown rice nasi lemak, just to see if they could replicate the traditional richness with just vegetarian ingredients. The fragrant, coconutty rice is surrounded by acar, cucumber, crackers, deep fried woodear strips (to replace the ikan bilis), homemade cabbage and carrot sambal, and rendang tempeh and pumpkin. The sambal was beautifully made with strong hints of lemongrass and lime, and there’s a lightness to this big dish of very balanced flavours. But, the firm tempeh and slightly mushy pumpkin in the rendang didn’t quite replace the requisite meat – in fact, it made me miss it even more. To be fair, the nasi lemak misses the mark only if you go in expecting the same sort of richness and flavours as a conventional nasi lemak with all the meaty side dishes. But judging by my two other meals at Simple Life, it’s obvious that the chef here has a knack for creating vegetarian dishes that appeal to both your eyes and your tastebuds.